I went on a marathon grocery store shopping spree yesterday afternoon to Earth Fare and TJ’s. 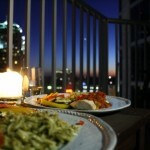 I came back with so many yummy goodies that I immediately had to start cooking dinner. Remember how I was perplexed about figs earlier this week? Well, I was dying to try out some of the suggestions you guys gave me about how to cook with figs. The most interesting flavor combination suggested, came from my friend Claire who I know from grad school. Halve figs and pat cut side dry with a towel. 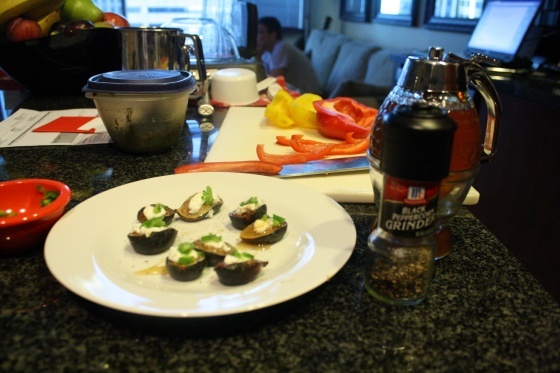 Smear with goat cheese (spicy/jalapeno if you have it! 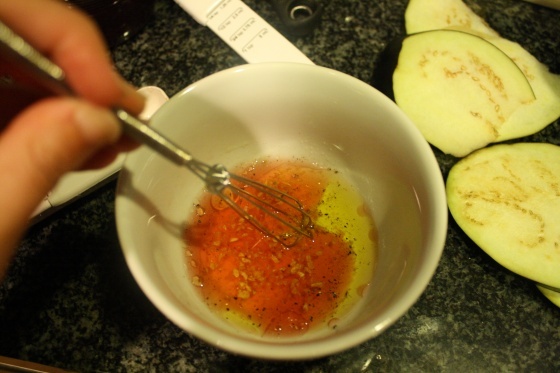 ), then drizzle with honey and a dusting of freshly ground pepper. The combination of flavors is awesome! I halved four figs and roasted them for five minutes at 500 degrees F under the broiler. Meanwhile I de-seeded a jalapeno and finely minced about 1/4 of it. 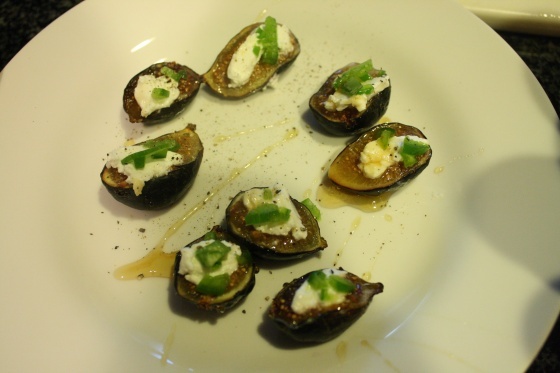 When the figs were done, I smeared just a dab of goat cheese on each fig half, then topped with the jalapeno. Finally, I drizzled the whole batch of figs with honey (with my super cool no-drip honey dispenser) and then added fresh ground pepper. 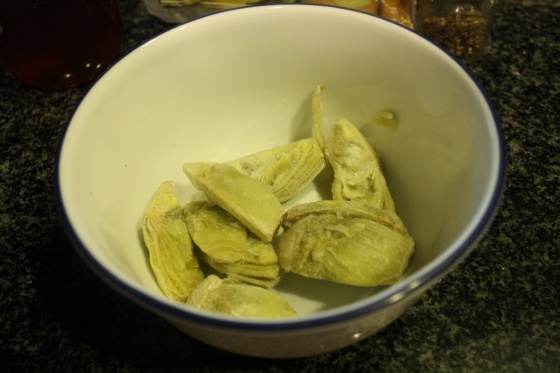 We enjoyed them as a little appetizer before I really got down to business in the kitchen. Claire was right. The flavor combinations were interesting but so good together. I think I like figs savory-style, but maybe I’ll have to try a sweet recipe at some point as well. 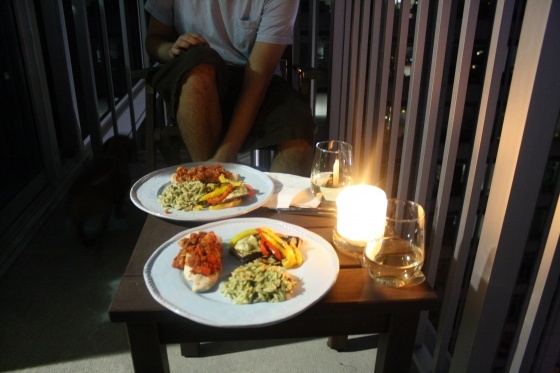 Next, I got to work on dinner by sauteeing four small mahi mahi fillets in a bit of olive oil. When those were done, I removed them from the pot and put them on a plate to warm in the oven while I made the rest of the meal. 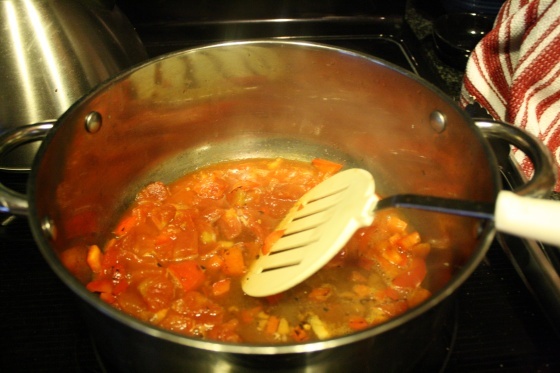 To the pot I added a bit more olive oil, about 1/2 cup chopped red bell peppers and one large clove of minced garlic. After these softened, I added 1/2 cup chopped artichoke hearts (I bought these frozen at TJ’s, but defrosted them in the microwave first), 1 cup of diced tomatoes, and 1/4 cup white wine. The wine doesn’t have to be fancy, just something you would drink. You’re only using 1/4 cup after all, what are you going to do with the rest but drink it? We used the Charles Shaw Pinot Grigio from TJ’s. I know a lot of wine snobs just wrinkled their noses at me, but Brad and I think Charles Shaw makes a nice table wine, especially for the price. I allowed this to simmer for about 10 minutes, then added 1/2 small can of tomato paste. Meanwhile, I sliced a medium-sized egg plant into thin disks and sliced up about 1/2 of two large red and yellow bell peppers. 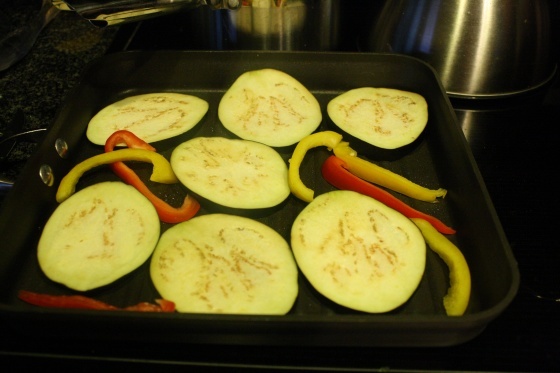 I put these on my grill pan after spraying lightly with olive oil using the Misto. The pan wouldn’t hold them all so I did this in two batches, putting the finished veggies in the oven to keep warm. In Italy, they served a lot of grilled vegetables dressed with a vinaigrette, heavy on the olive oil. I decided to mix up my own. I used one Tbsp. EVOO, 1 1/2 Tbsp. red wine vinegar, and 1/4 tsp. of garlic gold. I finally bought the seasoning that everyone has been raving about. Lastly, I made a very quick, but very delicious pasta. I used the last of some orzo we’ve been hanging onto for a while (~1 cup) and boiled it in salted water until it was fully cooked (Brad doesn’t like his pasta or rice al dente). I drained the orzo, then mixed in the last of the pesto I made last weekend. 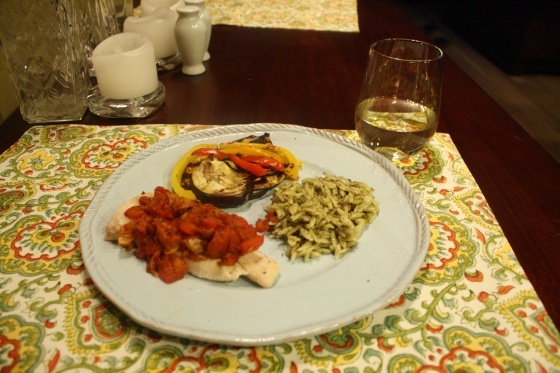 Next, I plated all the food, putting the tomato sauce on top of the fish, 2 tsp. 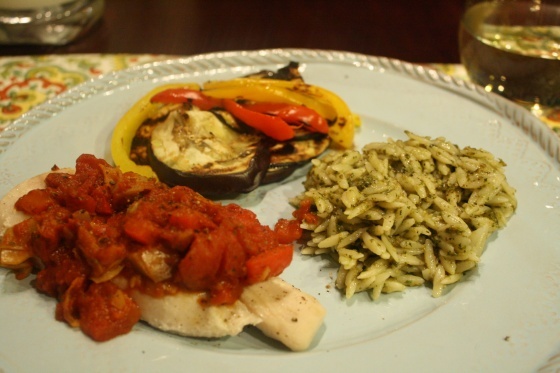 of the vinaigrette on top of the peppers and eggplant, and a bit of the pesto orzo on the side. 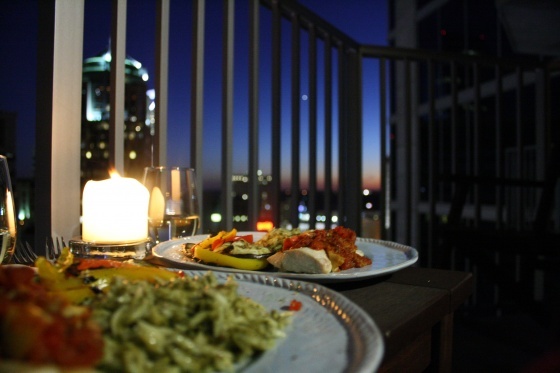 We had dinner on the balcony, but it was so dark at this point that I snapped a photo at the dining room table so you could fully see what the meal looked like. 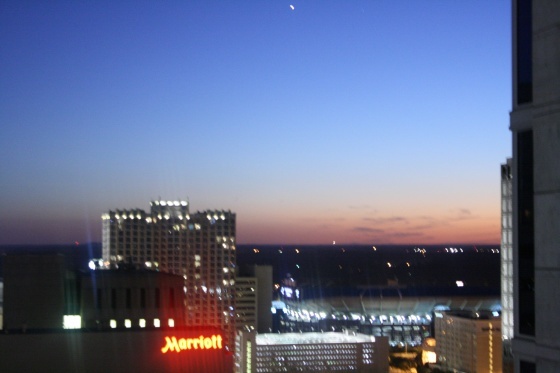 The sun setting over Time Warner Cable Arena, where the Carolina Panther play. We spent the rest of the night watching Into the Wild, which we both had been wanting to see for a while. It has been out on video for several months, but for some reason wasn’t available on iTunes, which is how we watch movies since we have a mini Mac hooked up to our ginormous television. The movie was really interesting and very introspective. To think that someone could leave everything they have, donate their life savings to charity, and head out into the Alaskan Tundra to survive completely in isolation. I really liked the movie and would definitely recommend it, especially if you are an outdoorsy type. On some level, people who truly enjoy the outdoors can relate to the desire enjoy the simple beauty of nature, apart from “civilization”. The main character in this movie totally took it to the next level.